So today is a special day for me personally. 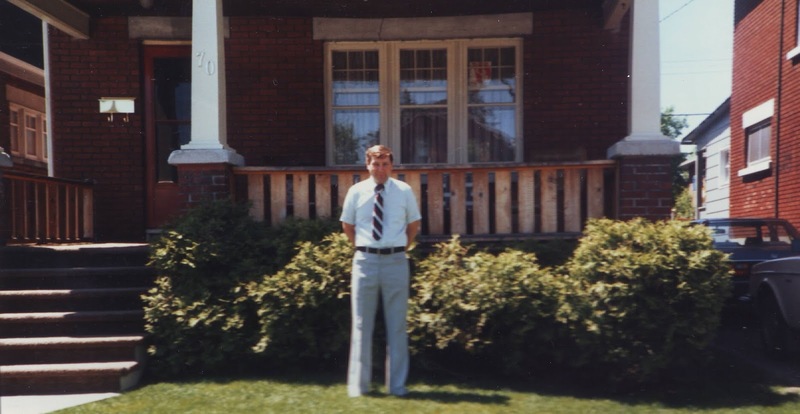 Today, May 30th 2016 marks the 30th anniversary of the day my parents purchased our family home at 70 Gilchrist Avenue. My Dad loved this house, and I love it just as much. I think, or actually I know, that sometimes friends and family even probably think I love the house too much. It's a great old house, with so much character and charm - and also so much family history now within it - and so today, I thought I'd just share a little information and a few photos of it. I think 30 years in a home is a pretty major milestone to hit. So as I've mentioned here before, my family has lived in the area for over 100 years on both sides of my family (nearing 150 years on my Mom's side). Growing up in the 80s, I was lucky to have both sets of grandparents living within three blocks of me, plus most of my aunts and uncles too. 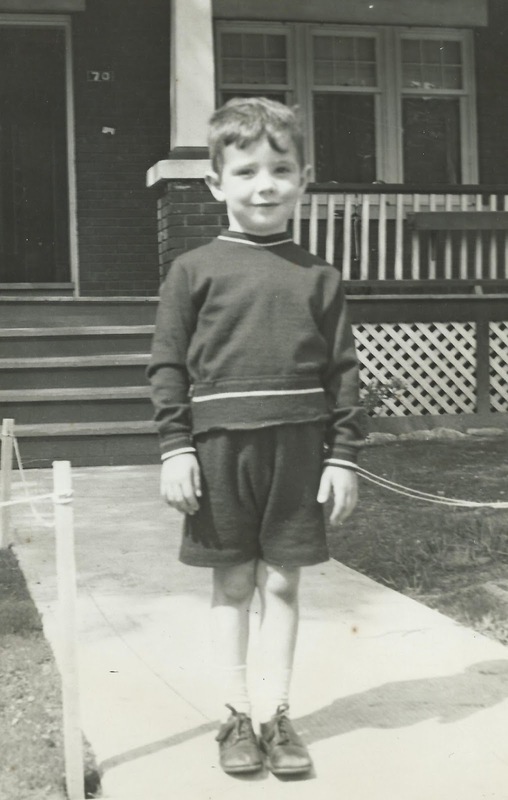 When I was first born my parents had been renting a home on Holland Avenue, half a semi, owned by long-time alderman Rolly Wall. Soon after I came along, elderly neighbours of my grandparents on Cowley were selling their home, and so my parents bought. 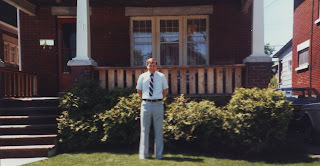 We lived there 5 years, at 200 Cowley, before the family grew again, and the 1.5 storey house was no longer big enough. My parents had made an agreement to purchase a new-build in Orleans, but the developers announced mid-construction that they were not able to legally build the house on that lot, and they had to cancel the whole arrangement. They offered instead a house on a different lot. My parents, perhaps (thankfully) having second thoughts about an Orleans move, decided to try to stay in the area, but timelines were now tight, since their house on Cowley had already sold and we had to be out in a couple of months. They bought a home in Britannia Heights, where we remained for less than a year, but they weren't happy there. My Dad Bruce Allston worked at Tunney's Pasture and so he drove and parked at my grandparents on Western each morning and walked to work from there. One day on the walk back home, he spotted the house for sale on Gilchrist and fell in love. 70 Gilchrist Avenue was built in the late summer and fall of 1927 by local small-time house builder George Swain. He also built the two homes next to it at 66 and 68 Gilchrist, at roughly the same time. The house was completed by the end of the year, and put for sale in 1928. It was purchased by Augustus Gladstone Long and his wife Muriel for $5,200, and they and their four children (at the time) moved in to the home. Augustus Long was a WWI vet, and was working as a clerk with DND at the time. 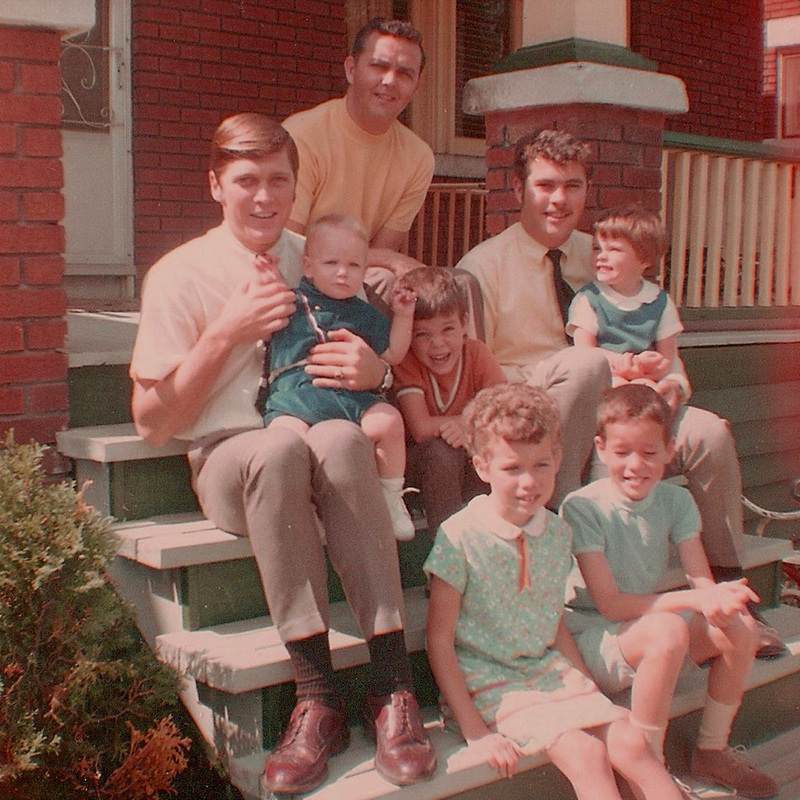 The photo of the family above unfortunately was not taken at 70 Gilchrist. It was likely taken just months after the family moved out, as baby Eddie was born just after the move. Sadly the two brothers standing in the rear of the photo both lost their lives in WWII. Brady was lost at sea in April of 1941 and Harry died in February of 1944. I had reached out to the Long family years ago to learn more about the family, and perhaps track down old photos of the house. We've stayed in touch since, and I was especially happy to welcome the youngest son Eddie Long and his family into the house in 2013 for a visit. Though Eddie was born just after the family had moved out, it was pretty neat for both of us, to make that connection back to the 1920s, inside the house where his family had lived. It's also worth mentioning too that Eddie is a well-known hockey star from his days in Ottawa, but particularly for his years playing pro hockey in Fort Wayne, Indiana, where he became arguably the top player in franchise history, hence his nickname "Mr. Komet". 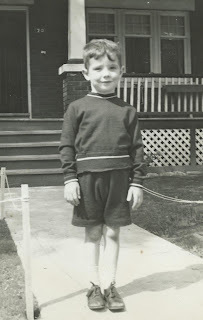 A few years later I was successful in tracking down descendants of the family who resided in the home in the 1930s, and was sent a copy of the photo from the mid-30s of one of the children standing in front of the house. What is most eerie about it is that just a year prior to receiving this photo, I had redone the front porch, and built new lattice to cover the porch supports. The end result is a mirror image of how the house looked in 1935, right down to the identical trim, including the piece running top-to-bottom in the center. Another neat story I heard from a former resident who once dropped in years ago was that our house was the first on the block to have a TV, and thus all the neighbourhood kids used to assemble on the front porch and watch TV through the front windows when it was still a novelty - the same original windows which I still battle with to install and switch-out every spring and fall. In the mid-1950s, our house was involved in a house trade between two families, who both had listed their respective houses for sale, had found each other's houses and fell in love. Even more ironic perhaps was that out of the blue in 2010 I was hired by the owner of the house on Brennan Avenue that had been traded for 70 Gilchrist, to do the history of her house! My parents downsized in 2008 and moved to a modest bungalow on Tweedsmuir, and that was when I purchased the house from them. A couple of renovations later (new bathroom/kitchen, and complete foundation replacement + dug down 3 feet through mostly rock to have a finished basement) and the house lives on proudly occupied by my wife and I with our two kids (and #3 on the way this July!). My Dad passed away suddenly in 2011, but I like to think that a big piece of him still lives on in our wonderful family home, and in the gardens which he loved so much. Well-respected Canadian artist Patrick Mason (http://www.patrickmasonartist.com) kindly agreed to do a commission piece for me a couple of years ago, of my Dad in the backyard garden, and outdid himself with this incredible piece, which I will use as the perfect way to end this post, celebrating 30 years of the Allstons at 70 Gilchrist Avenue! 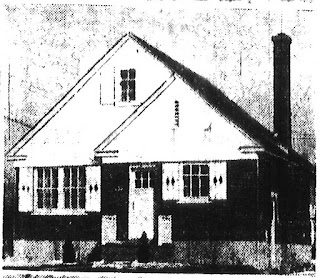 The new issue of the Kitchissippi Times is out, and my column this week is on the history of the great old stone building on Churchill just south of Scott Street, known as "Westboro Manor". It is presently the home of law firm Farber-Robillard-Leith, but has a nearly 130 year history that started life as a home, one of the very first structures built in all of the west end, and certainly one of the oldest still standing. I was particularly impressed to find out that it's builder was none other than Joseph O'Neil, who I've profiled before in a couple of articles as the builder of one of my favourite houses in Kitchissippi, the house which is now Bella's on Richmond Road at Island Park. A neat coincidence for sure. Anyways, it's a full profile of the history of the building, also taking in to account how Churchill Avenue, and Westboro as a whole changed around it. Thankfully Izzy Farber and his firm have appreciated the building and maintained it exceptionally well, and so we still have this link to the 1880s standing in the neighbourhood. It's an exceptionally nice building on the inside as well, if you ever have the opportunity to see the interior. In July of 1897, the City of Ottawa was expanding rapidly, and the explosion of the suburbs, fueled by the arrival of rail transportation led to new requirements in areas that were wilderness just a few short years earlier. The need for cemeteries was a particular topic of interest for citizens in Ottawa. If you've been paying attention to the news recently, you may have heard about the discovery of human remains by workers digging the tunnels under Queen Street. This is understandable, since some of Ottawa's earliest cemeteries were located here. In fact, the early-mid 1800's saw the relocation of multiple cemeteries in Ottawa, both due to the ever-expanding size of the city, and the advancements in transportation. When Ottawa was in its infancy as Bytown, having a cemetery on Queen Street west of Elgin made sense - the city was barely more than a shantytown anyways, largely built up in the lowertown area (east of the Canal), and they needed somewhere to bury the canal-workers who were dying of various fevers and ailments, and particularly those affected by the massive cholera epidemic of 1832. The Barrack Hill Cemetery existed from 1827 until 1845, until the City decided to cease burials in downtown, and established the Sandy Hill Cemetery further outside the built-up part of town (where McDonald Gardens now exist), which operated until 1873, by which time again the city had expanded beyond the cemetery again. 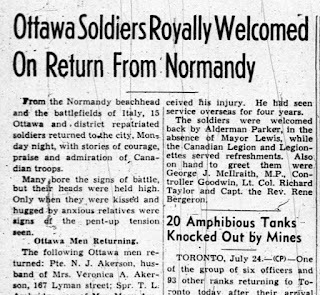 Thus Beechwood and Notre Dame cemeteries were opened, again on the far outskirts of town, where it was felt Ottawa would never reach. Of course it did, but the problem by the late 1800s was more so that the city was growing extensively to the west, and Beechwood was quite far. 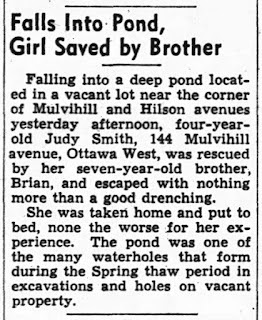 There were a series of smaller cemeteries in the west end - most notably the "Merivale Cemeteries" south of what is now Hunt Club, and one or two in Bells Corners. But nothing large for the growing communities in the western suburbs. Pinecrest Cemetery was still years away from opening (1926). The plan, according to the article, was to open a 75 acre cemetery on the Holland and Hinds property, with options to even make it larger if the adjoining lands owned by Heney and Hayes were acquired as well. 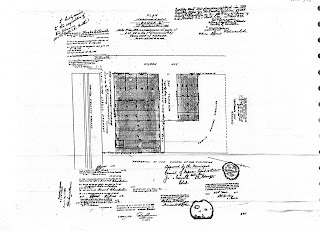 I reviewed old land registry documents to try to lay out the land ownership as it was in July of 1897. See the map below (please forgive my amateur-level map-editing/drawing skills, MS Paint is the extent of my abilities!) The boundaries should be fairly close though. * The red rectangle around the whole area shows the area of lot 32 in concession 1 of Nepean Township (it actually extends north all the way to Scott Street, but didn't include any of that area north of Richmond on the map as it wasn't pertinent). * The blue line represents where I imagine the access road from Richmond Road would have likely run (today's Hilson Avenue). * I also put little stars where all the structures at that time existed. Two still exist today (the Holland home became the Convent, which is now hidden behind the horrid condos on Richmond; and the Aylen-Heney house is on Richmond just by Kirkwood, with the stone face and tin roof). To put the size in perspective, this cemetery would have been a little larger than Pinecrest Cemetery is today. Though this was front-page news on July 29th, 1897, the story dried up here. There was never a mention again in either the Journal or the Citizen of a cemetery being located here. So why did the idea die? One of the likeliest reasons is that just two days (!) later, Hugh Hinds Sr., one of the principles involved in the deal, passed away. Hinds was the son of a United Empire Loyalist, James Hinds, and as the article states, was a long-time prominent member of the Orange Order, a Protestant fraternal organization that is closely tied to the early days in Ottawa's history. 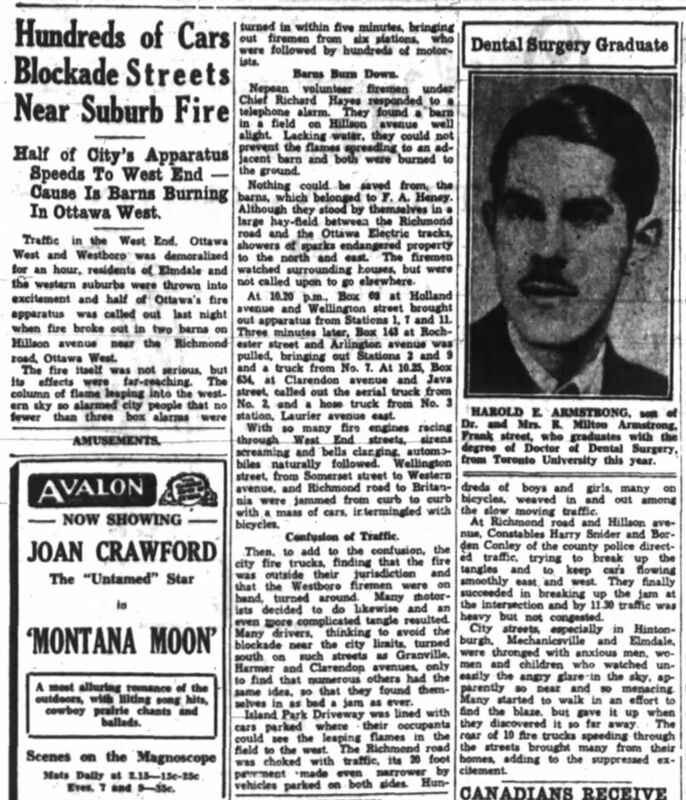 Hinds resided in Ottawa, and he died at a fairly young age (60). His death likely caused a delay in any momentum that had been building on the project, and at the very least would have delayed any pending real estate transactions, as the will and probate would have taken some time to process (even back in 1897). Though his son Hugh Jr. had built his new home just a few years earlier near what is now the north-east corner of Kirkwood and Sebring (identified as the potential "caretaker's residence" in the article), he moved off the property not long after his father's death. Hugh Jr. sold the property soon after the cemetery deal fell through to a market gardener James Ridgway, and moved in to Ottawa. Sadly, he too would pass away soon after, at the far-too-young age of 31 in April of 1900. 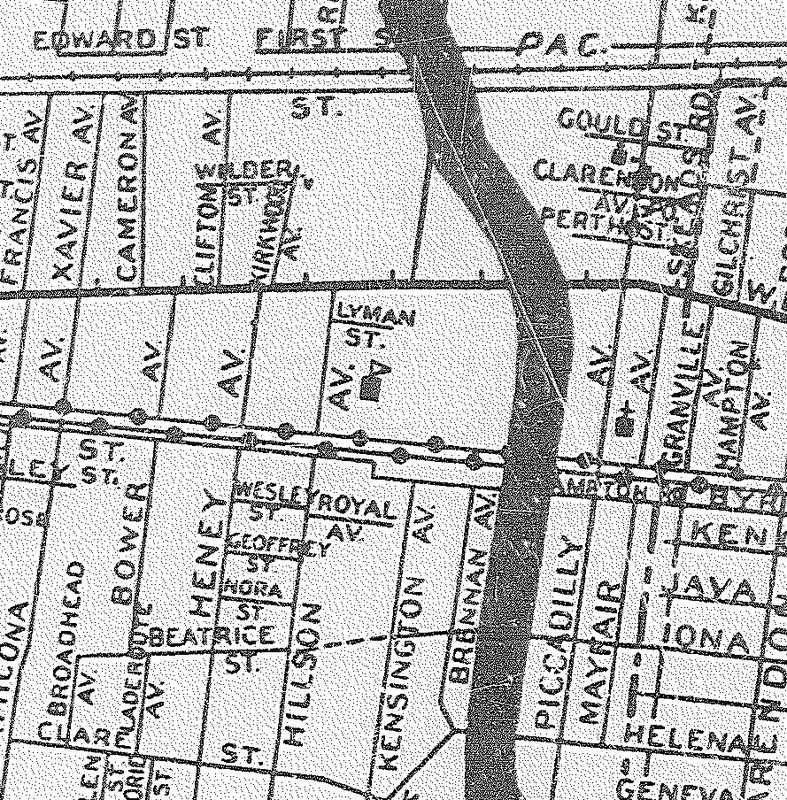 George and Alison Holland meanwhile, with the cemetery project dead, laid out the first real subdivision of lot 32 in May of 1899 (Carleton County Plan 186), creating Hilson Avenue and Kirkwood Avenue (then called Heney Avenue). The plan laid out 18 small builder lots at the south end of the plan, in the vicinity of Clare Street, officially putting an end to the possibility of a large cemetery being built on their property. An interesting idea, but for whatever reasons, the Hollands and their potential partners decided not to see it through. Perhaps it was the untimely death of Hugh Hinds Sr., or perhaps hesitation by the Hollands (who realized the true need for a west end cemetery was still a few years away), or maybe it was a change of heart by the two unnamed investors in the "cemetery scheme". 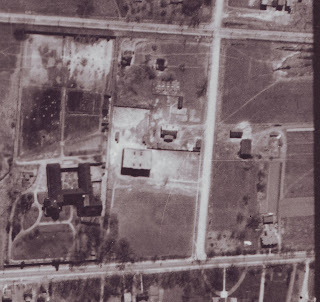 Otherwise, today's Kitchissippi might have instead featured a huge 75-acre cemetery! Kitchissippi Museum - updates & tidbits! Just wanted to share a few quick points! * I will be at Artspark on Saturday May 28th (weather permitting of course!) at the Parkdale Market Park, with a table of old maps, photos, artifacts and what not. So please stop by and say hi! * The Kitchissippi History & Heritage Group has the next meeting scheduled - It will be on Sunday June 5th, from 2-4 p.m. at the Kitchissippi United Church on Island Park Drive, just south of the Queensway underpass (formerly known as Kingsway). Anyone is invited to attend, and this will be a really important meeting as we will have staff from the City Planning Department on hand to discuss their project to rebuild the Heritage Reference List. I'll have another post dedicated to this meeting in the next week or two, so consider this a "save the date" for those who are interested. * I have a couple of articles in the works for the blog (and the Kitchissippi Times). Should have something out in the next day or two with a story that is pretty shocking, what part of the Hampton-Iona-Westboro neighbourhood nearly developed as in the late 1800s. * As always, if you have anything hiding in old family photo albums, photos of old houses, buildings, streets, etc., please let me know. I'm always chasing old photos of anything local. You'd be surprised how useful a random old photo of a house can be! Name meaning: Mulvihill was named for Annie Mulvihill (1834-1875), mother of Howard Chamberlin, who subdivided the land on the east of Hilson. Chamberlin's plan established one new street which he called Mulvihill Avenue, after his mother's side of the family. Howard was the eldest of ten children. 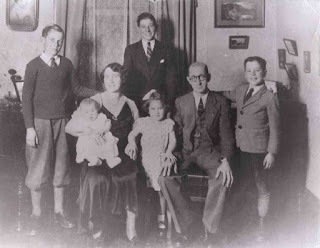 Annie Mulvihill died due to complications from childbirth while giving birth to her tenth child, at age 41. Lyman Street was named by George and Allison Holland in an early subdivision of their property, but it's significance is unknown. 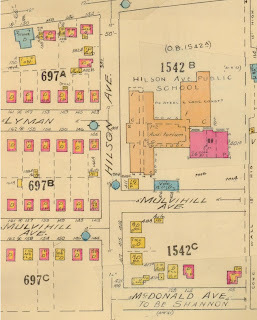 How named: What is most interesting is that though Lyman and Mulvihill run only west of Hilson today, they both had their beginnings as street segments running only east of Hilson. Neither of these original segments exist today. 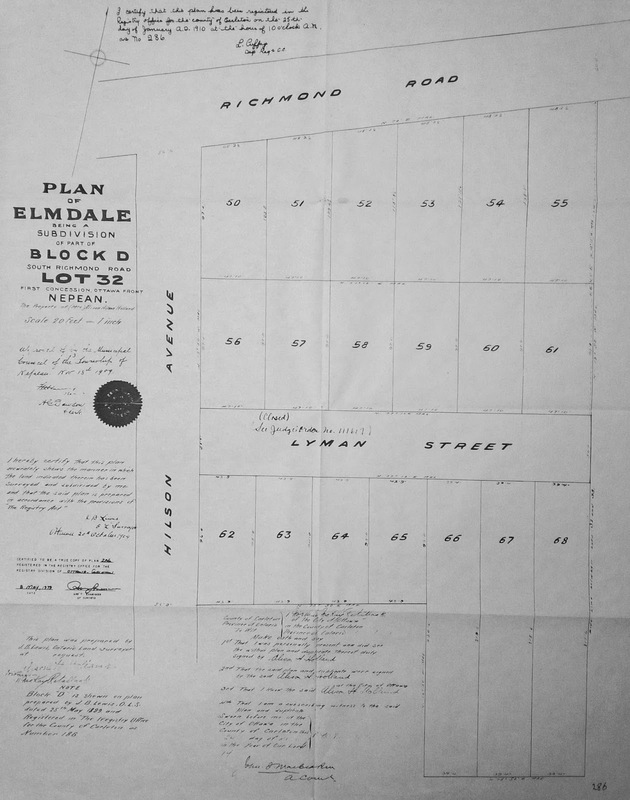 On October 20th, 1909, George and Allison Holland subdivided one of their last parcels of property which they owned alongside Richmond Road, and created Plan 286. It was a simple little plan of 19 individual lots, some facing onto Richmond, but also a newly created street which they called "Lyman Street". None of these lots would ever be sold or built on however. Just two months after registering the plan, the Hollands sold the entire subdivision to a trio of local businessmen, who in turn a month later flipped it to Fred Heney (who owned much of the land immediately to the west). 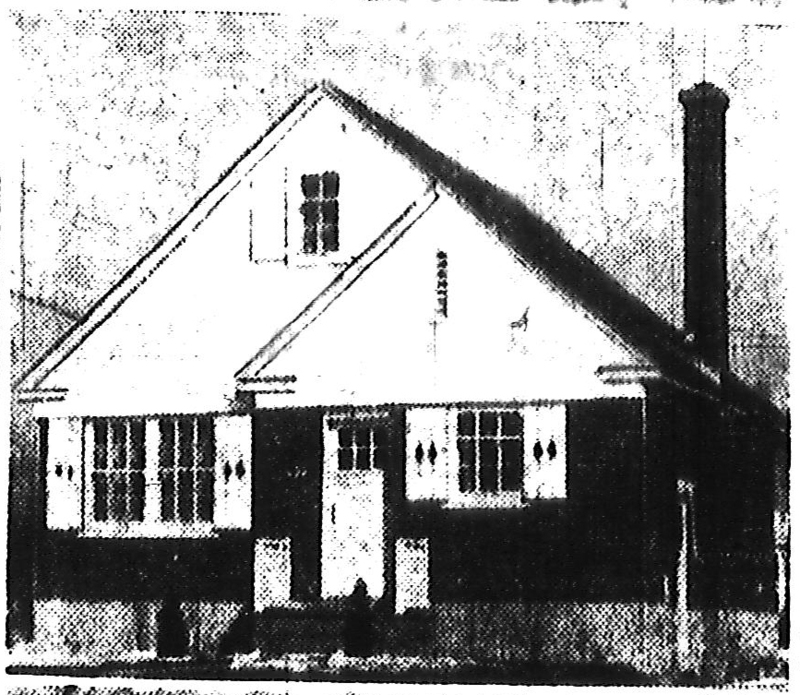 Heney later sold it to the Nepean Township school trustees, who established Hilson School on the property in 1914 (ironically on the subdivision plan which the Hollands originally called "Elmdale"). The original Lyman Street would run through the north end of the new Hilson School today. 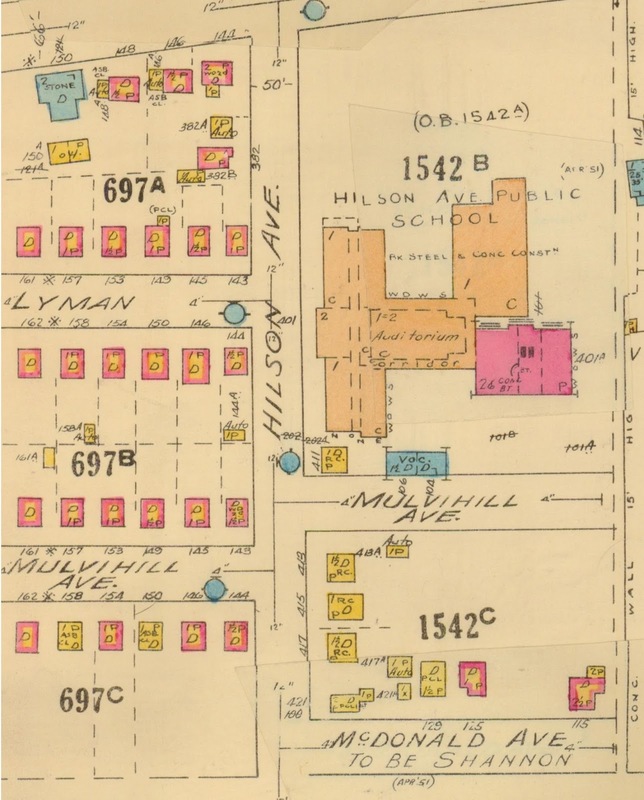 Mulvihill similarly was established on a subdivision plan that was created by Howard Chamberlin in 1915 and registered in January of 1920 (Plan 395). This plan connected like a puzzle piece into the Holland Plan 286. 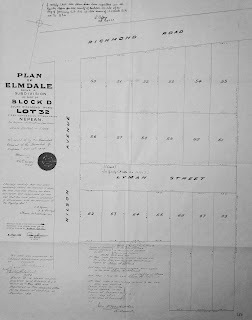 On this equally small plan were 15 builder lots on two new streets created running east off of Hilson, just north of the electric streetcar line, which Chamberlin called Mulvihill (after his mother's maiden name) and McDonald Street (after his wife's maiden name, it has since been renamed and is now known as Shannon Street). Howard Chamberlin (1862-1940) was an early letter carrier in the late 1800s, and continued working for the federal Post Office until 1921. He was especially known for his work with the Roman Catholic churches of Ottawa (he was the Ottawa district representative of the Catholic Record and Catholic Register), and was an original member of St. George's parish. He lived in a great brick house that still exists today at what is now #115 Shannon Street (built in 1904), which he purchased in 1905 from it's builder Charles Rochon. The house was the only structure in the vicinity at the time, and was situated on what was a 2-acre lot. 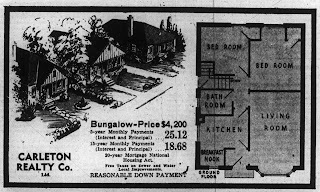 Ten years later, Chamberlin laid out that acreage into the Plan 395 above, surrounding his house on lot 1. This Mulvihill Avenue was located exactly where the parking lot entrance to Hilson School exists today. In the early days, it would see two houses built on it. One of them was particularly interesting, a stone double was built sometime between 1910 and 1916, at 127-129 Mulvihill. This house faced south (towards the streetcar tracks), and was located where the south part of the school now stands. 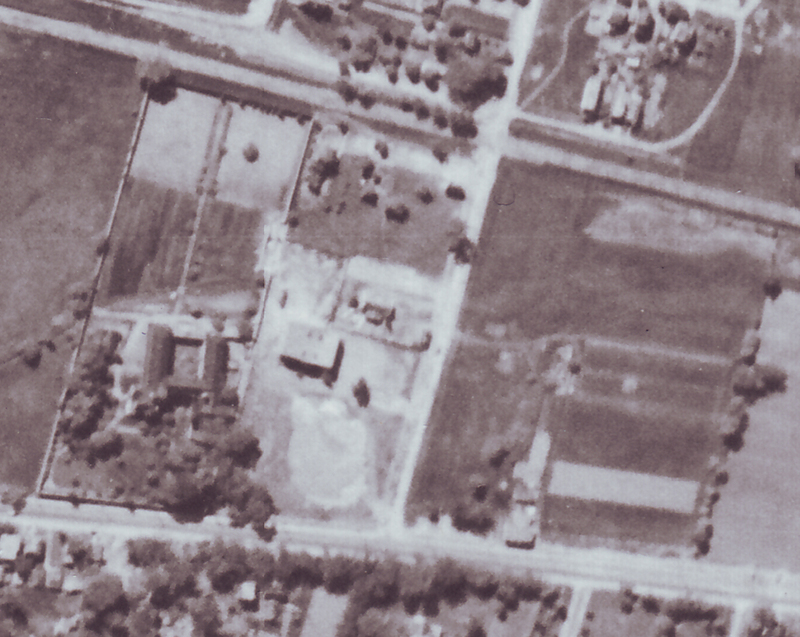 When the original Hilson School was built, it was less than fifty feet away (though a long wood fence separated the properties). 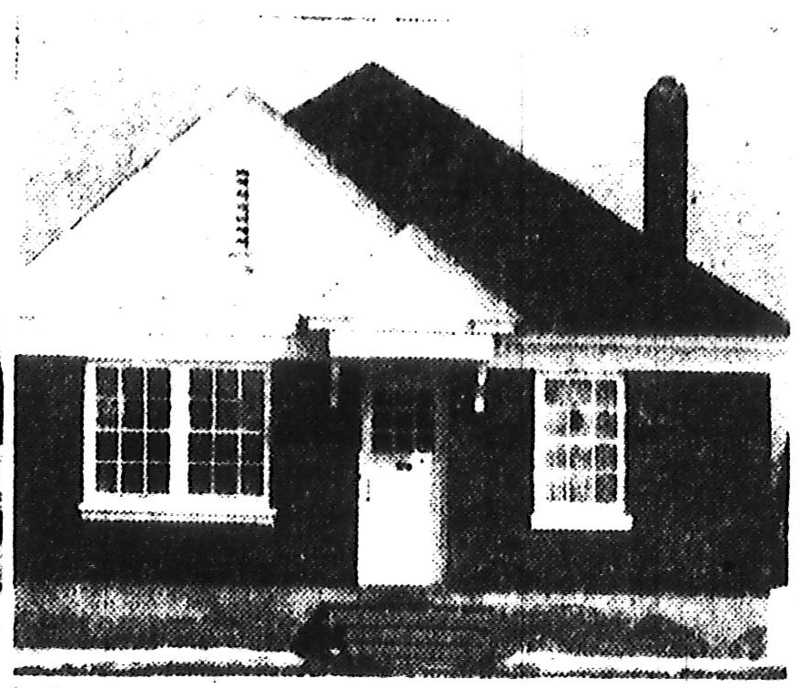 This house was rented to tenants for the entirety of its existence, and was torn down in 1948 after the school board acquired some of the surrounding property to expand both the school and the playground area. The Weir family resided in the #129 half of the house from the early 1930s until 1948, and I was able to track down a few family members, but unfortunately none had a photo of this neat old stone house. One of the family members I spoke with was Alanna Weir (who was 1 year old when the family moved out of 129 Mulvihill). Impressively, she had 12 siblings; her Dad had divorced and remarried a much younger wife, resulting in Alanna having sisters who were 20 years older, but also sisters 18 years younger that her. The other house on old Mulvihill was a tiny wood-frame house, #135 Mulvihill, located on the northeast corner of Hilson. 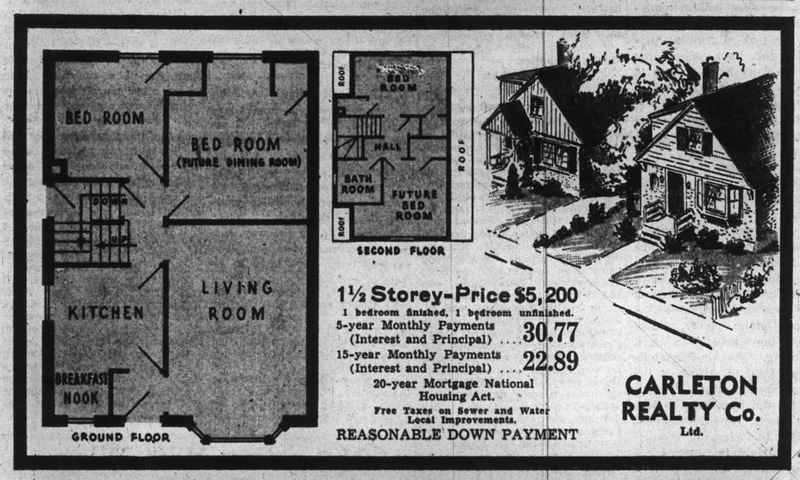 Built in the late 1930s, it was a very simple dwelling (its assessed value throughout the 1940s was just $300). It too was acquired by the school board in the late 40s but remained as an occupied house until the 1990s. 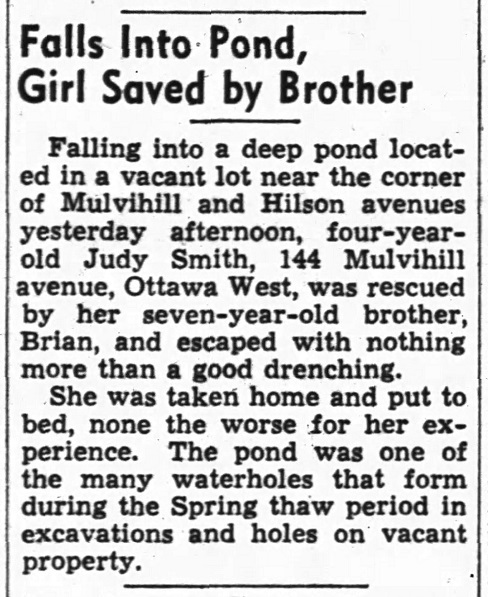 It was given a Hilson Avenue address after the original Mulvihill Avenue disappeared. The old Mulvill became just a small parking lot for the school until the Hilson rebuild. 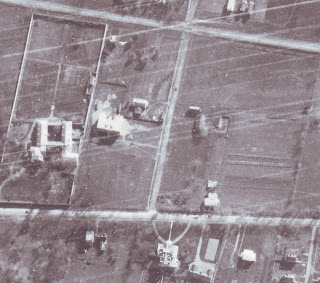 Both of these original houses can be seen on the early aerial photos below. they Aylen-Heney house and barns (west of Hilson). which provides a higher resolution/better quality. on the Heney Farm property now gone. The Aylen-Heney house and the barns stood on this parcel of land as it transformed from a rural farm, into a large garden used by its long-time tenant Frederick Harding, a professional market gardener, who would grow fruits and vegetables here throughout the early part of the century, and eventually into the era where the land sat as an empty hay-field, as development blossomed all around it. It was quite an oddity that this piece of land continued to sit vacant up until WWII. It was equally an oddity that the land would finally be developed in the midst of this major war. 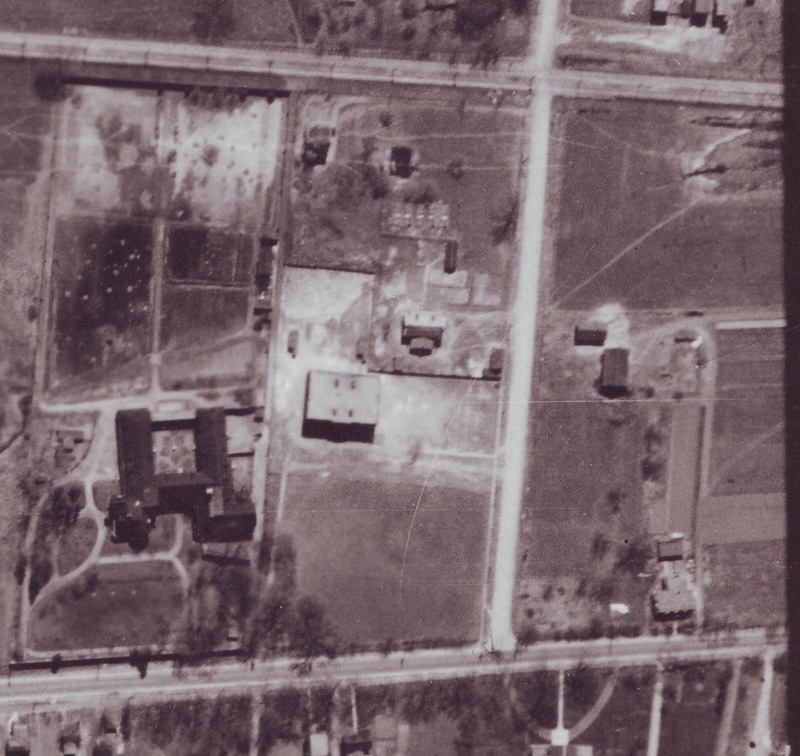 But on July 16th, 1943, Frederick Heney sold the 4.5 acre piece of land south of Richmond Road, between Hilson and Kirkwood to the Carleton Realty Company, for the sale price of $4,000. 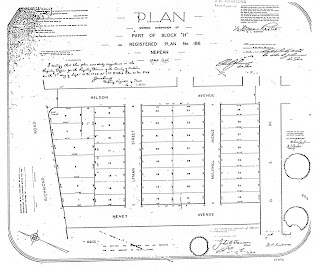 Two weeks later the Carleton Realty Company submitted their subdivision plan for the community, which was registered with the Carleton County Registry Office as Plan 440. They called this neighbourhood "Heney Park". Included on this plan were two new streets, Lyman and Mulvihill. Since Lyman only existed on paper for a brief period 30 years earlier, and the old part of Mulvihill was only a tiny segment that didn't even align with the new street, it really is surprising that the CRC decided to use these names. 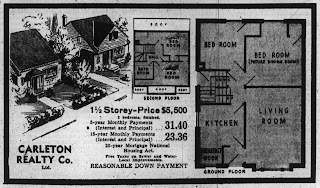 Who were the Carleton Realty Company? 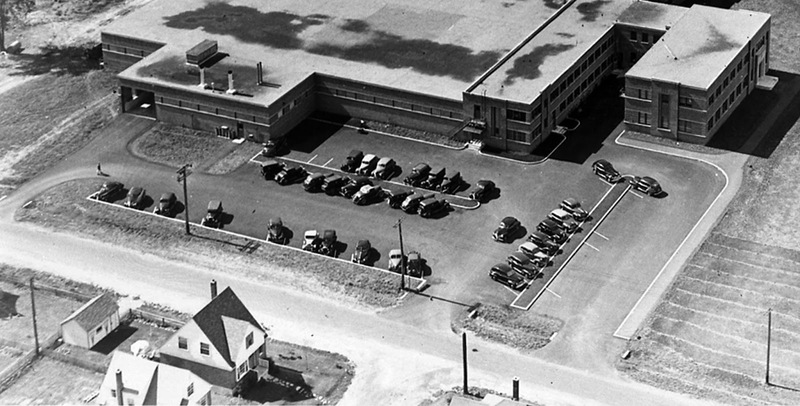 They were one of Ottawa's top developers during the 1940s, and involved some of the top names in building at the time. Their presence in west Ottawa would end in spectacular fashion just a few years after their Lyman/Mulvihill project. 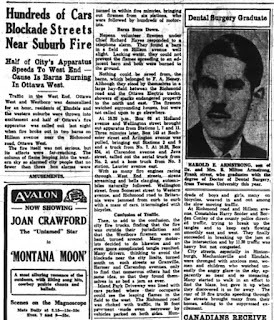 The CRC found their opportunity through the federal deal made by the Ottawa Home Builders Association (on whose board all of the principles of the Carleton Realty sat) with Munitions Minister C. D. Howe for funding to build much-needed homes in Ottawa due to housing shortages. It was crucial that Canada have the ability to provide housing for its returning soldiers at the end of the war; this was a disaster after WWI where soldiers returning home to major housing shortages, no jobs and little government assistance. 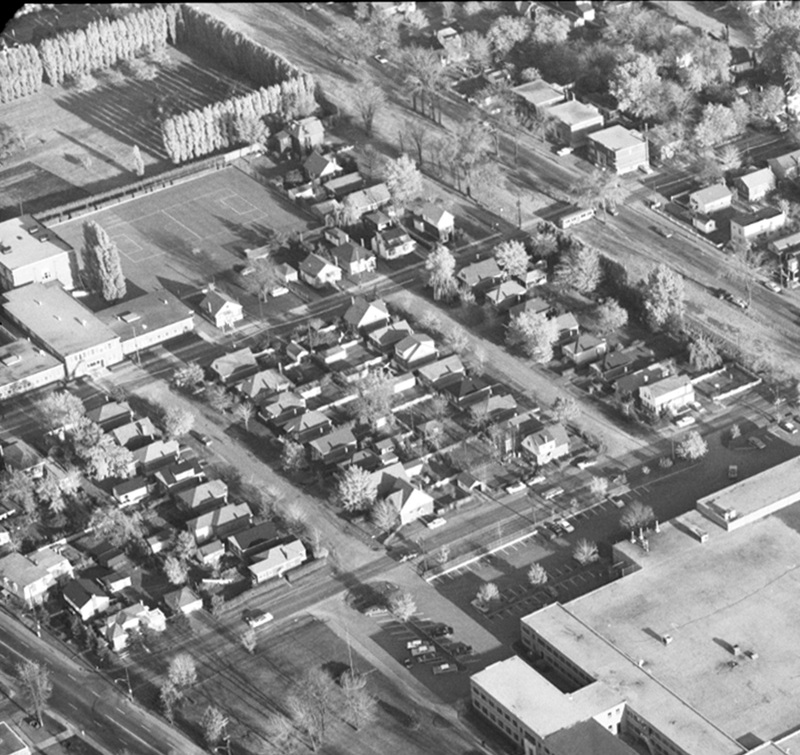 The CRC began purchasing large lots of land, predominantly in the Hampton Park area and along Island Park Drive, and were building large blocks of homes at a time. Thus Lyman and Mulvihill did not develop slowly over time. The area went from being an empty space to a complete neighbourhood in a matter of months. Plan 440 had 39 lots (including lot 3 on which stood the Aylen-Heney house) total. 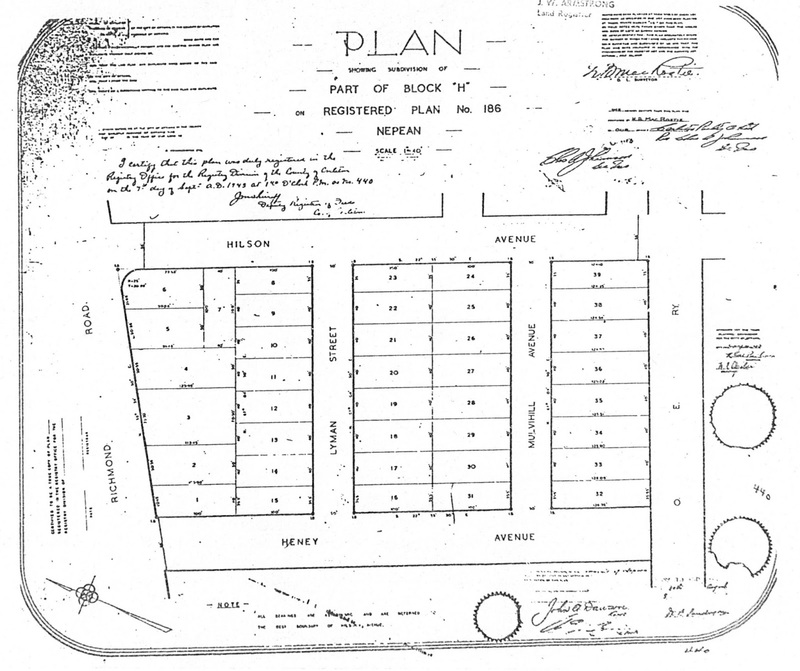 The first lots were sold on July 30th, 1943, the very same day the subdivision plan was registered. All lots were sold at the standard price of $450 apiece (this even included the lots fronting on Richmond Road). The first to sold on July 30th were 145, 153, 157, and 167 Lyman. * Carleton Realty did not take out any mortgage, but just built and sold - 2 houses were sold like this. The construction of the houses were fairly standard. Buyers had some customization options, but the floorplans and styles were fairly similar, which is why you can walk around these streets and identify a few exact matches for most of the houses. Even the mortgages required were standard at $3,200 (24 houses had this amount), with some as high as $4,500 (4 houses) for those who selected upgrade options or larger construction types. "These houses will be of the bungalow and 2-storey type with 2 bedrooms and bath up, and three different plans of each type are offered. The floor plans of these new homes are pretty well standardized, but the prospective home owner will have the chance to express his personality in the exterior designs. Stucco on cinder blocks and solid brick construction will be used for these modern homes. Basements will be full-sized with cement floors and cement foundations. All will have grade entrances. The purchaser may express his preference for cedar or asphalt shingles and here the entire gamut of color awaits his individual desires and tastes. These new homes are modern and inviting. The kitchens will have all the conveniences of plenty of cupboards and a dining nook and will be equipped for the installation of all appliances. These homes will have hardwood floors and the interior finish will be in accordance with the wishes of the intending purchaser, than which nothing could be more satisfactory. These houses will be heated with hot air piped furnaces with hot and cold air ducts. A complete set of storm windows and storm door are supplied with every house and further assurance of warmth in Winter and coolness in Summer is due to the use of one-inch Ten-Test for wall insulation and rock wool insulation for the ceilings. The various trades and supply houses have given indication of their approbation of this home building plan by co-operating in every possible way, and it is due to their willingness to furnish supplies at most considerate prices that the enterprise is at all possible. The purchaser of one of these new homes will be the one to reap the benefit." 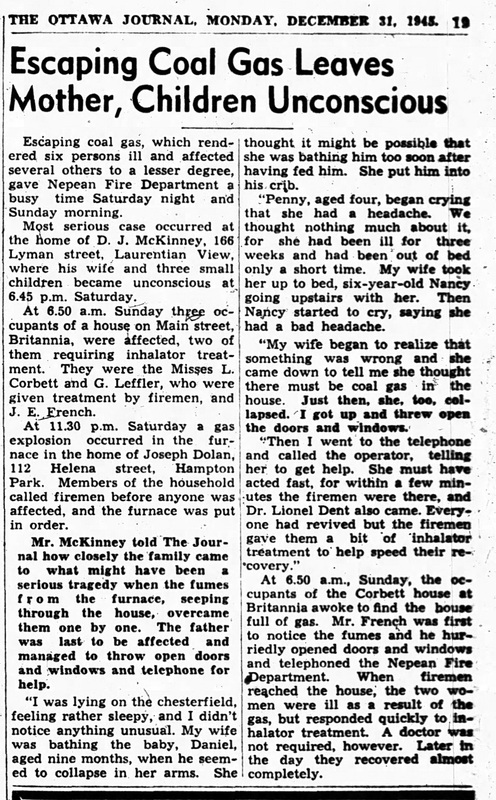 The list of contractors Carleton Realty used, of which many were local included: Albert Bethell (concrete contractor, 90 Richmond Road); Bytown Paint Supply (417 Bank Street); Brunt Manufacturing Co. (heating equipment, 181 Lyon Street); M.F. Beach Lumber Co. (Winchester); Wilfred J. Carriere (plumbing and heating contractor, 396 Piccadilly Avenue); F. Fentiman & Sons (builders' supplies, overhead garage doors, and insulation, 335 Roosevelt Avenue); Gerard & Gerard Ltd. (plastering contractors, 18 Rideau Street); Independent Coal & Lumber Co. (Bank Street); S. Lena (masonry contractor); Lowrey & O'Connor (asphalt tile and mastic floors, roofing, siding, 90 Richmond Road); Mahoney & Rich Ltd. (excavations, 50 Besserer Street); Ottawa Light Heat & Power (56 Sparks Street); W.A. Rankin Ltd. (hardware, 410 Bank Street); G.H. Spratt (sand and gravel, Billings Bridge); and J.M. Carriere (plumbing and heating contractor, 125 Caroline Avenue). 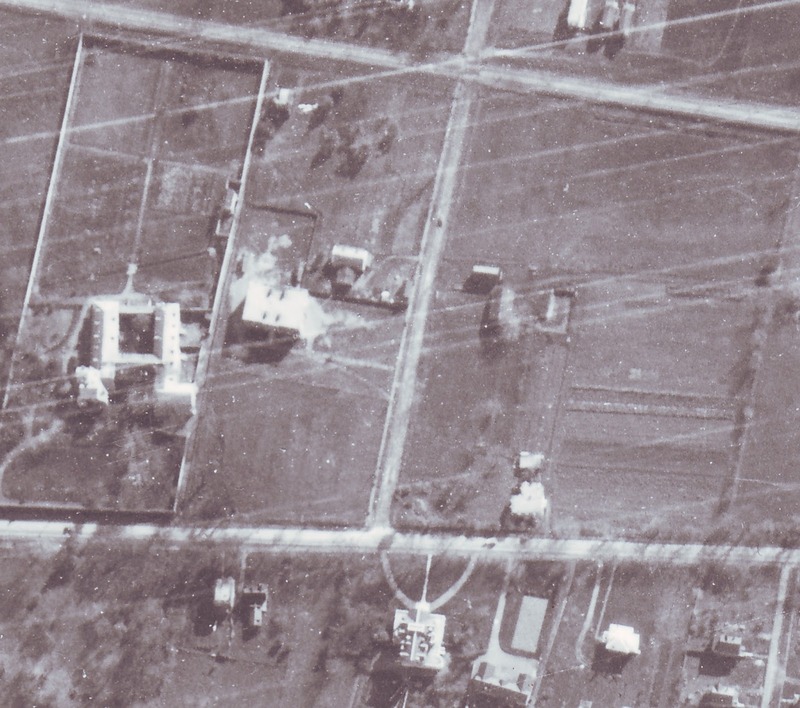 By the assessor's visit in March of 1944, all of the houses in the subdivsion were complete. 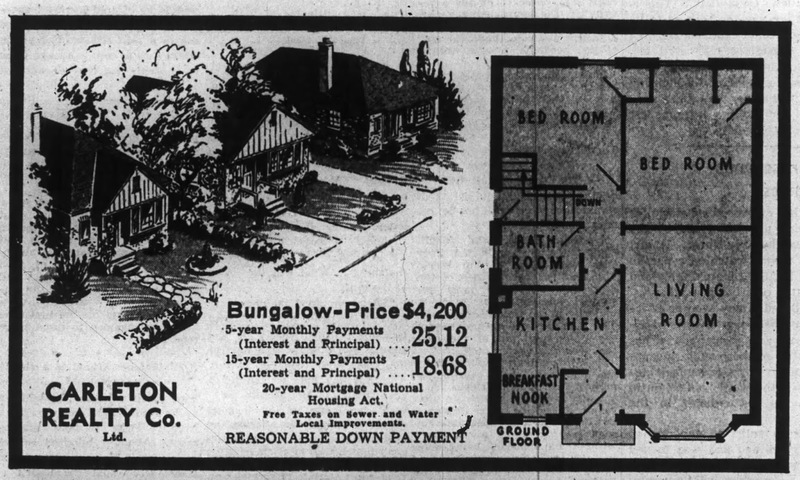 All of the houses fronting on Richmond Road had a value of $2,450 or more (note that like today, assessed value wasn't necessarily representative of the true sale or construction cost, but it does give a good indication of which house was completed with more features/etc.). On Lyman, the top valued house was 146 Lyman, built for Hugo Bortolotti, valued at $2,100 (the rest of the houses ranged from $1,525 to $1,950), and on Mulvihill, the top valued house was the house at the corner which fronts onto Kirkwood (#421 Kirkwood), valued at $2,550 (the rest of the houses on Mulvihill ranged from $1,650 to $1,975). The age range of these first owners and occupants were as young as 24 & 20 years old (Howard J. and Dorothy K. Smith, who bought 153 Lyman) to as old as 55 year old Major George Cloutier and his wife Mary Eileen, who purchased 167 Lyman. The occupations of the purchasers included military men with the Army and Navy, a linotype operator, lawyer, bricklayer, radio machinist, mechanical draftsman, and butcher. Also worth mentioning: 145 Mulvihill for no apparent reason was built but never sold by the CRC. It ended up being sold in 1950 by the CRC's bankruptcy agents. 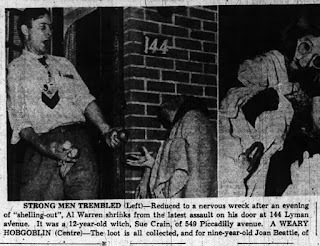 Also, Reginald W. James (whose young wife was the victim in my Smirle Avenue murder article (http://kitchissippimuseum.blogspot.ca/2015/11/the-sad-and-shocking-smirle-avenue.html) was the first owner and occupant of 149 Mulvihill. 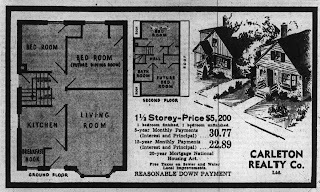 The Citizen in April 1944 ran a full page ad by Carleton Realty which showed many photos of houses they'd built in the last year. These two below are likely from Lyman/Mulvihill. The top one looks like it probably is 143 Lyman. Following the completion of these houses, Carleton Realty moved on to another segment of "Heney Park" south of Byron Avenue, a new subdivision of 55 houses, and later in the year began work on a project of 125 larger homes between Tweedsmuir and Kirkwood. Their work would continue through to 1947, but then shocked the city by declaring bankruptcy. 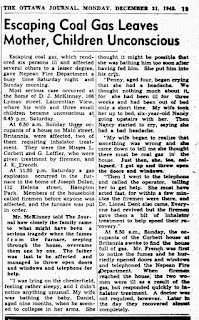 The Ottawa Citizen reported on June 1st, 1947, that most concerning about the bankruptcy were the veteran homes that Carleton Realty had only partially finished. They had commenced construction on 200 low-cost homes for veterans “principally of the bungalow and two-storey type and mainly in the Heney Park area of Laurentian View. In the majority of individual cases, the war vets had financed the building and purchase of houses through re-establishment credits, gratuities and loans of the Central Mortgage and Housing Corp. The original contract prices for the homes ranged from $6,000 to $7,000 it was reported, and many veterans had used all available resources for construction costs. 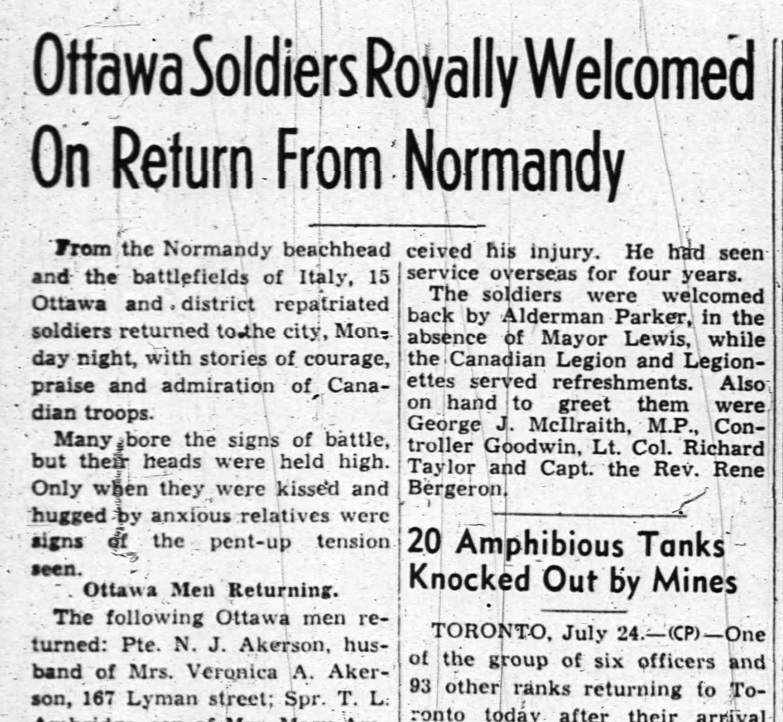 These ex-servicemen were said to be in financial difficulty with the prospect of losing their homes unless some organized assistance is provided following the assignment of the building company.” Later in June it was reported that 104 claims had been made against the Carleton Realty Company, with a former executive stating that the bankruptcy had occurred due to a “shortage of labour, materials and increased costs.” The CRC bankruptcy was followed-up in the Citizen in the fall to report that veterans were still at risk of losing their homes, and in some cases were years away from being able to afford having construction completed on their homes. A sad end to a great company, though some of the principals involved, such as the Johannsens would go on to do great building work in Ottawa during the 50s and 60s. The houses were only a few months old when the first tragedy was felt. On March 9th, 1944, it was reported that Sgt. 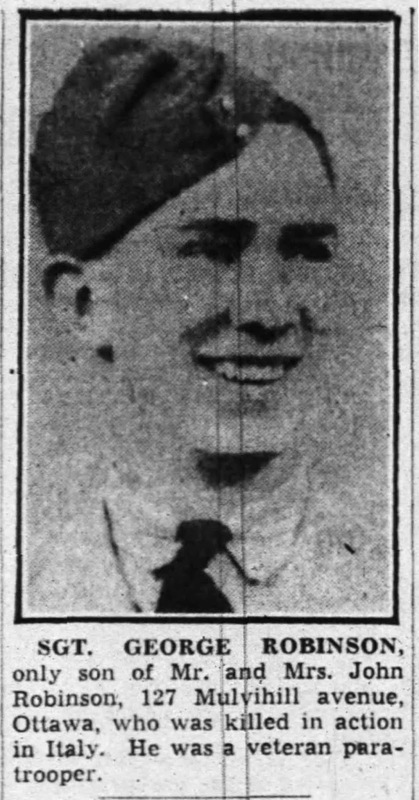 George Robinson, 20-year-old son of Mr and Mrs John Robinson of 127 Mulvihill Avenue had been killed in action in Italy. A former student of St. George's School, George was a paratrooper who had trained in a unit attached to the American Army in commando and invasion tactics. He attempted to enlist in 1940 before he had turned 18, but was not accepted until May of 1941. He fought in Japan, and several other countries, before sadly losing his life. 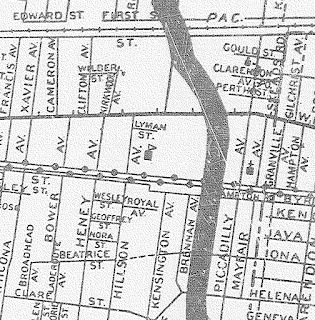 It is worth noting as well that on February 19th, 1968, Bylaw 40-68 was passed by Ottawa council to expropriate 2 feet of land from the properties that bordered Kirkwood Avenue from Richmond Road all the way to Carling, in order to widen Kirkwood Avenue. The homeowners alongside Kirkwood off Lyman and Mulvihill were paid a little more than $4 per square foot for their lost land. 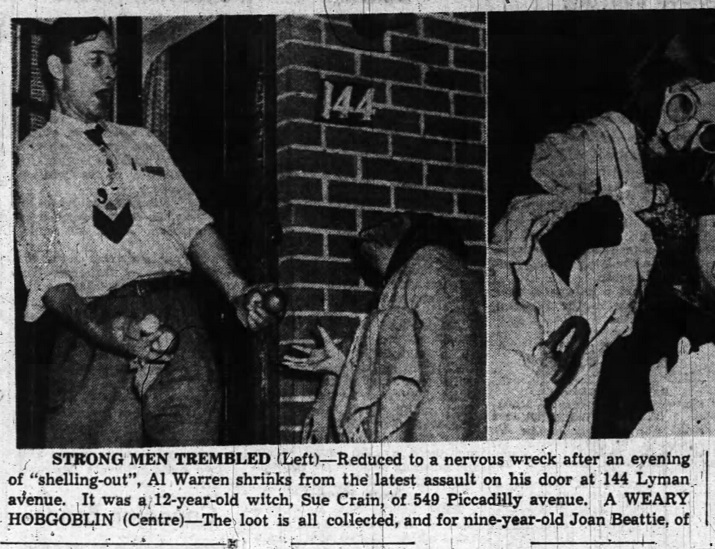 Photo of Halloween Night 1949 at 144 Lyman Street.